Location: South side of Station Road in the village of Talysarn. Present state: Station building extant. village of this name. The station building wasa substantial two-storey structure, austere but well-proportioned and possessing some dignity. Slates were employed not only for the hipped roof but also as cladding on the walls. Beneath the flat awning with its saw-tooth valance, which extended the length of the building’s platform elevation, the wall was of red brick with yellow brick used for decoration around the door and window openings. There was a single platform, and the line continued for only a short distance to the east beyond it to a point where there was a watering facility. The station was provided with a loop to allow locomotives to run around the trains. In the early days there was also a turntable but it had been removed by the early years of the twentieth century. ran onto the platform thereby allowing easy transfer between wagons of both systems. The narrow gauge line remained horse-worked. As well as being used to bring slate to the station it also conveyed coal and other materials up to the quarries. 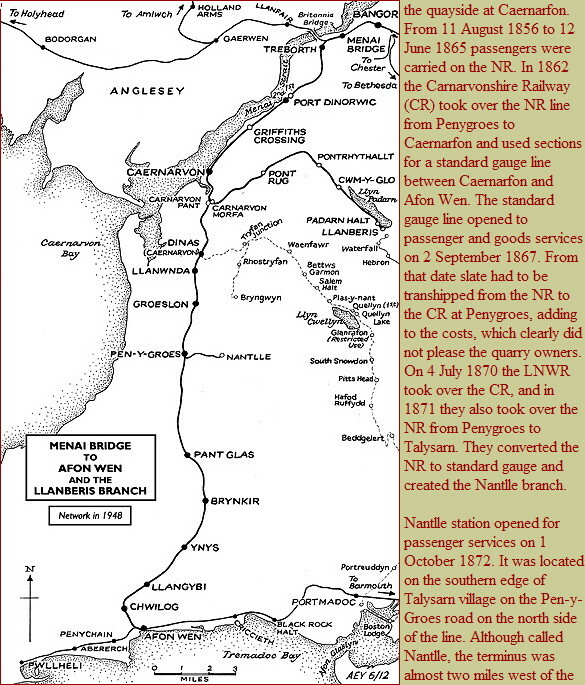 The passenger service at the time of opening ran mostly as a shuttle between Nantlle and Penygroes with a few running to, or starting from, Caernarfon. By December 1895 Nantlle had seven departures and eight arrivals on Monday-to-Friday as shown in the table below. Extra services ran on Saturdays but there were no trains on Sunday. During the early years of the Great War the LNWR experimented with a petrol-electric railcar on the Nantlle branch. The single-coach railcar was not a success. It could not pull more than its own weight so could not be used for shunting operations at Nantlle between passenger turns; moreover, in the winter its roof-mounted radiators froze. The experiment was abandoned. As an economy measure passenger services were withdrawn from Nantlle on 1 January 1917 and were not reinstated until 5 May 1919. The July 1922 timetable showed a healthy level of service on Monday-to-Saturday with twelve departures and eleven arrivals as shown in the table below. On 1 January 1923 the Nantlle branch became part of the London, Midland & Scottish Railway (LMS). During the 1920s competition from local buses began to have an impact, but even by 1925 there were eleven trains from, and ten to, Nantlle on Mondays-to-Fridays with an extra train on Saturdays. The LMS continued attempting to compete with the bus services, its summer 1932 timetable showing Nantlle as having twelve departures and ten arrivals on Monday-to-Friday as seen in the table below. On Thursdays there were an extra two trains in each direction, and on Saturdays there were sixteen arrivals and thirteen departures. Despite this level of service the LMS could not compete, and the passenger service was withdrawn completely on 8 August 1932. Excursion trains continued to visit Nantlle during the 1930s but its primary function was as a goods station. Daily goods trains continued throughout the 1930s; even in the early 1950s there was still a daily goods service. In 1956 the service was reduced to three per week. The railway strike of the previous year had resulted in a catastrophic loss of traffic. On 5 May 1957 the Stephenson Locomotive Society’s ‘Caernarvonshire Rail Tour’ visited Nantlle. The tour included a trip in horse-drawn wagons along the tramway. On 20 October 1963 the Stephenson Locomotive Society, in partnership with the Manchester Locomotive Society, ran another rail tour to Nantlle, also called the ‘Caernarvonshire’. Again there was a trip on the tramway, but on this occasion the wagons were hauled by a farm tractor. The rail tour arrived at Nantlle at 2.35pm and departed at 3.43pm allowing just over an hour for the trip on the tramway. The tour was the last passenger train to ever visit Nantlle. On 2 December 1963 goods services ceased to run, the last outward train being a trip working to Caernarfon. The horse-drawn narrow gauge line operated until the end and had the distinction of being the last horse-drawn line on the British Railways network. The track was lifted shortly after closure, but the station building survived and in 2012 was in use as a community centre. A car park and landscaped area had been created on the site of the goods yard. 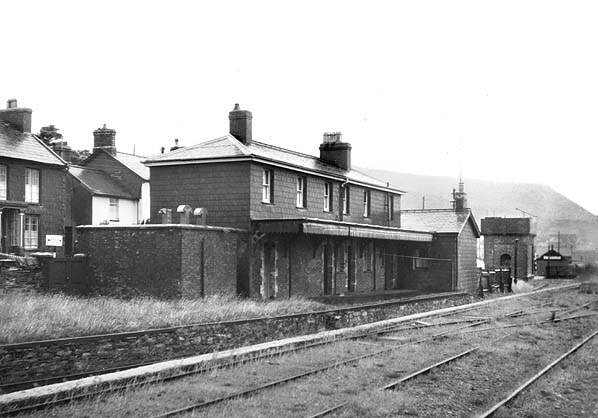 Looking west at Nantlle station in the early years of the twentieth century. 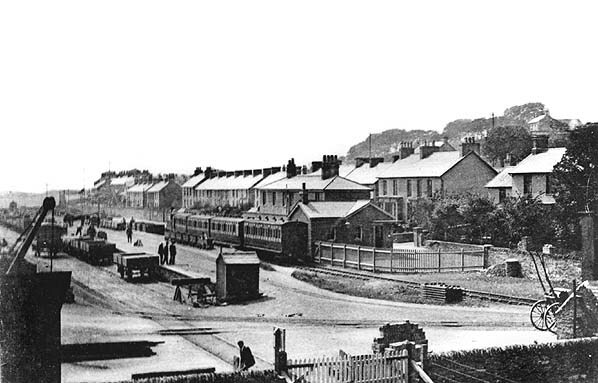 A passenger train for Penygroes can be seen waiting to depart. To the left of it the transhipment sidings between the Nantlle branch and the 3ft 6in Nantlle tramway appear to be busy. 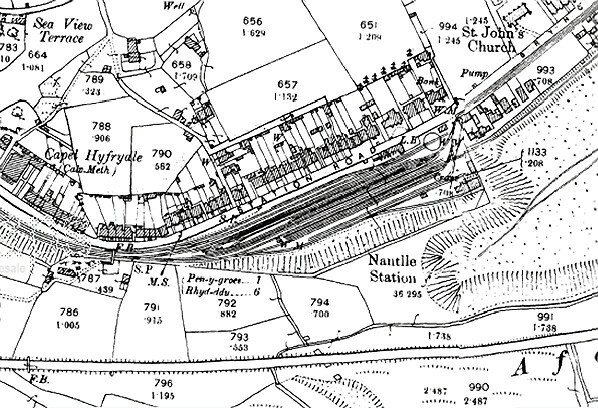 Nantlle station shown on a 1900 map. 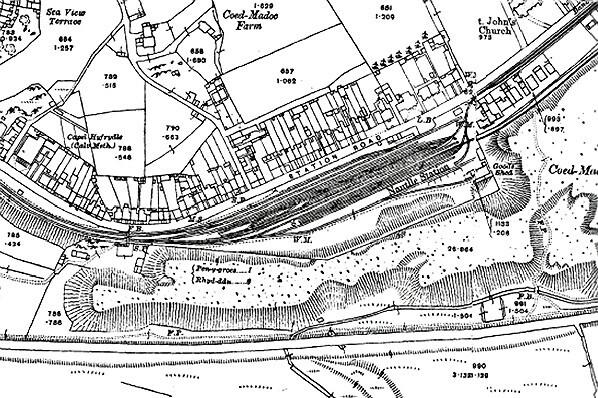 The turntable at the east end of the station was still present. 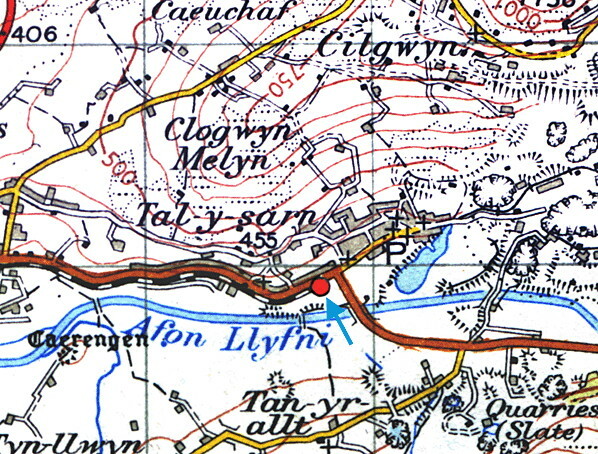 Nantlle station shown on a 1916 map. the turntable had been removed by this time. Nantlle station looking east along the 3ft 6in tracks of the tramway in 1948. The tramway had originally extended all the way to Caernarfon as part of the Nantlle Railway. Since 1872 it had terminated at Nantlle station where quarried materials were transferred into standard gauge railway wagons. 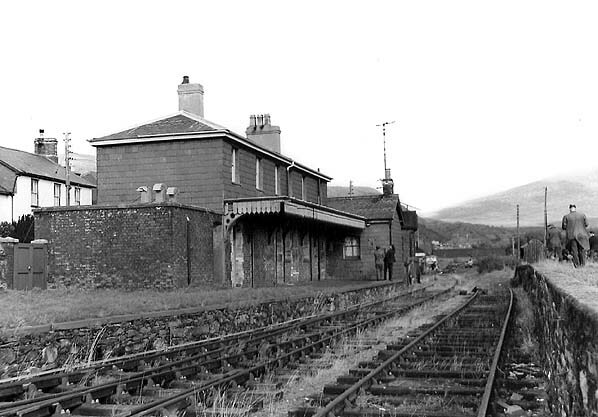 The eastern end of the Nantlle branch looking towards Nantlle station in June 1956. 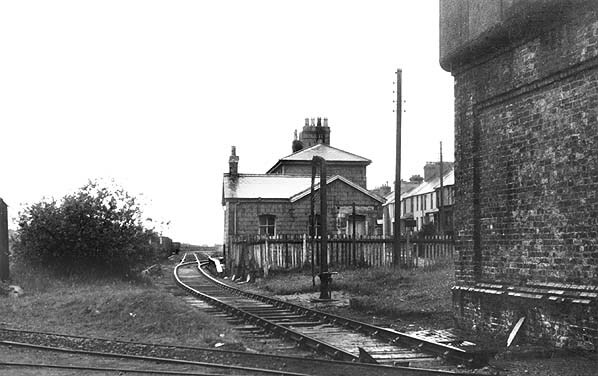 The station, seen in the middle distance, had remained unaltered since it closed to passengers in August 1932. Running from left to right in the foreground can be seen the 3ft 6in lines that led up to the quarries. These lines had originally formed part of the Nantlle Railway which had opened in 1828. Traffic along them was horse-worked until the system closed in 1963. Nantlle station seen from the 3ft 6in quarry line transhipment sidings in July 1963. 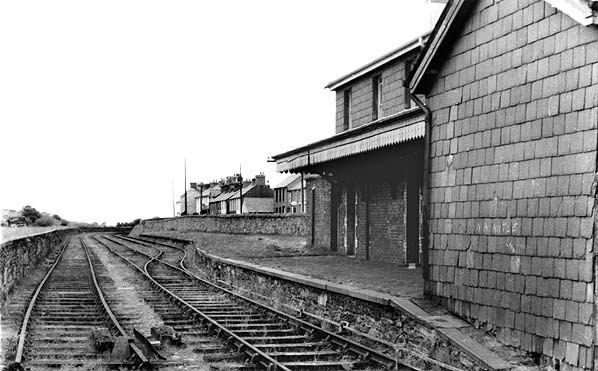 Looking east at Nantlle station in July 1963. Only three goods trains per week ran to Nantlle by this time and an air of dereliction had set in. were brought down from the quarries. 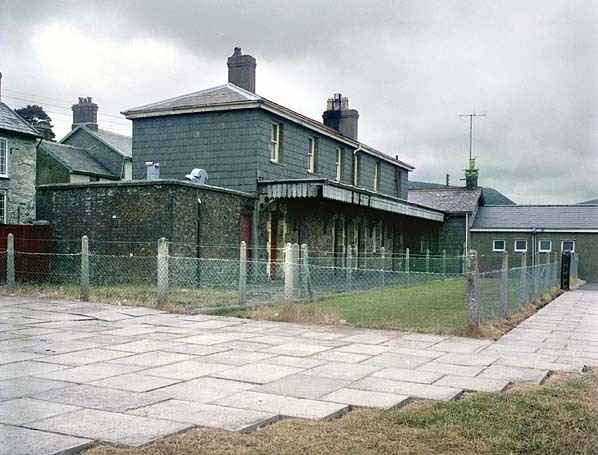 Nantlle station looking east in May 1979. 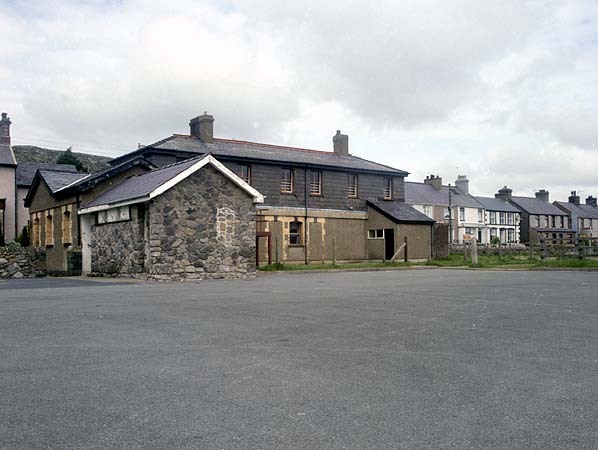 Nantlle station seen from the site of the transhipment sidings in May 1991. Looking east at Nantlle station from a point that would have been adjacent to the western end of the platform on 25 May 2012. 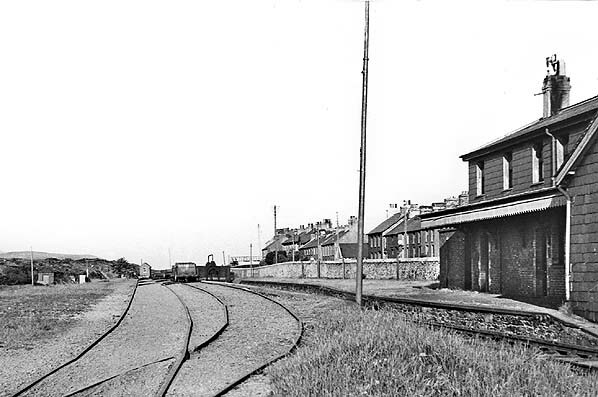 The original station building is seen left of centre. Nantlle station looking west on 25 May 2012.